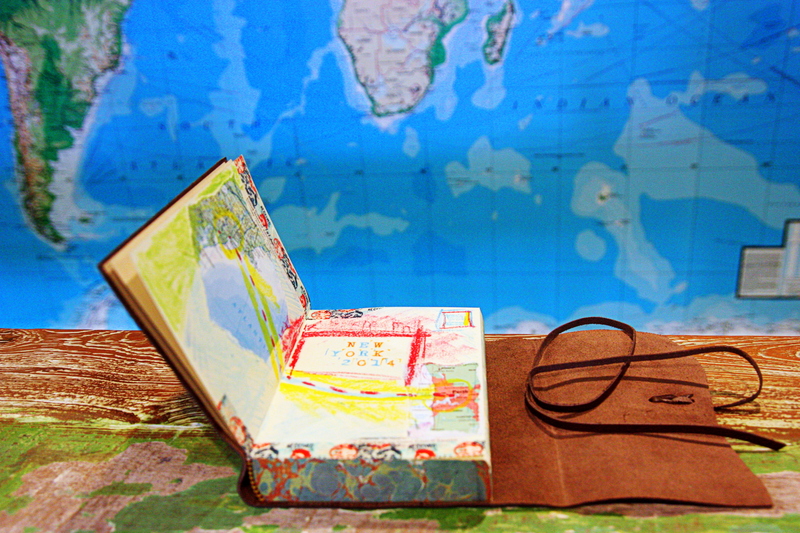 Alain de Botton described the traveling mindset as one of receptivity and openness. In 1794, Xavier de Maistre applied this mindset to his own everyday space. In my own experience, of traversing thirty three countries so far, travel is learning. Being submerged in the unfamiliar brings to the surface captivation, imagination and vulnerability. I think being abroad is sometimes where we feel we can be most ourselves, untethered by daily routines, obligations, expectations and the mundanity and productivity of daily life. So how is an educator to bring this outlook to professional meetings and visits abroad? My approach is one of embracing creativity. Research connects creativity with productivity, adaptability, novelty, divergent thinking, idea generation, flexibility and problem solving (see Dr Mark Runco’s 2004 article on ‘Creativity’ in the Annual Review of Psychology). For me, writing, drawing, painting, doing and making are physical mind-body processes which facilitate right brain thinking, foster creativity and enable authenticity – of thought, of action, of being. Sir Ken Robinson’s 2006 TED Talk on how schools kill creativity has been viewed almost 30 million times. In it, he champions the cultivation of creativity and questions the rigidity of education systems which encourage conformity and compliance. The #makered hashtag on Twitter and http://makered.org/ have plenty of ponderings, resources and perspectives on the meaningfulness of making and doing for our students. Of course social media and this blog are 21st century extensions of traditional creative media but I am intending largely to ‘go retro’ on my October professional journey: reading print novels, keeping a visual journal, collecting tactile ephemera and enacting mindful pen-to-paper thinking. Using the camera and a journal to explore thoughts and experiences is a method of creative, reflexive, deliberate inquiry, as well as a way of recording both professional visits and New York herself. I hope this flânerial approach – that of the wanderer who is finely attuned, keenly observant and totally immersed – will help me to be at my most receptive, flexible and open to new learning. 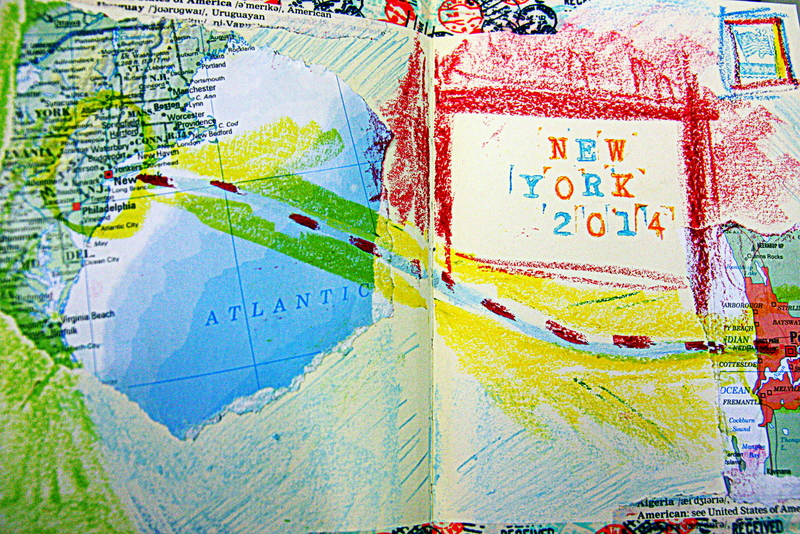 This entry was posted in Creativity, Education, Travel and tagged Alain de Botton, art journal, Cavallini, creativity, learning, maps, new york, NYC, travel journal, visual diary by Dr Deborah M. Netolicky. Bookmark the permalink. For more on the MakerEd movement, see Sylvia Martinez’s great Edutopia post here: http://www.edutopia.org/blog/maker-movement-shoulders-of-giants-sylvia-martinez in which she theorises MakerEd as shareable, transformative construction. Thanks, Jo. Nice to find a kindred collector-scribbler! I find that the physicality of drawing, writing and pasting, as well as the framing of experiences through taking photographs, collecting ephemera and writing impressions, is part of the travel experience for me, anchoring me in the moment and processing its personal meaning. This is also a mindset I try to take into my everyday life: openness, wonder, noticing details, being present and finding the extraordinary in the ordinary. A few years ago a colleague and I gave ourselves a ‘be a tourist in your own workplace’ assignment. For a week we took tourist-type photos in locations around the school, then made them into a postcard which we ‘posted’ to other teachers on staff. Anything to encourage new ways of seeing the world around us, whether familiar or foreign!